Finally, after several calls and emails, Talbot Freeman of Talbot Freeman & Associates, confirms the sale of Monte Fino's 25m megayacht Lady Diane with Ralph Navarro of Florida Yachts International representing the buyer. Talbot says, "Originally launched in 1998 as La Contessa, this is the fourth time we've sold this well maintained Monte Fino 82. Each owner has found it an ideal platform to move up to a larger yacht and the sellers have already taken delivery of their totally refitted 38m Sovereign superyacht we sold them last year." 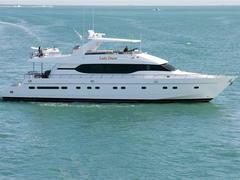 Lady Diane sleeps six guests in a full beam master, VIP and twin and was on the market at $1.495 million.